#THISISMYADVENTURE - Ben James, Svalbard; Coast to Coast via the Top. I’ve learnt already that when I have a message from Neil Cox, it means he has a proposition for an expedition coming my way. A painstaking, gruelling, laborious expedition, somewhere remote, unsupported, dragging near enough my body weight in kit. In all honesty, I wouldn’t have it any other way, what’s an expedition if you don’t suffer through it? I’d discussed a mutual interest in Artic travel with Neil before and following the Iceland Traverse, it felt like something that might be attainable, although it had only been a dream before. This time around we were looking further North and into the Arctic Circle. Svalbard came up top of the list of the group discussions. Leanne Dyke was again coming with Neil, and Tom Harding, following their successful Kyrgyzstan Expedition together. 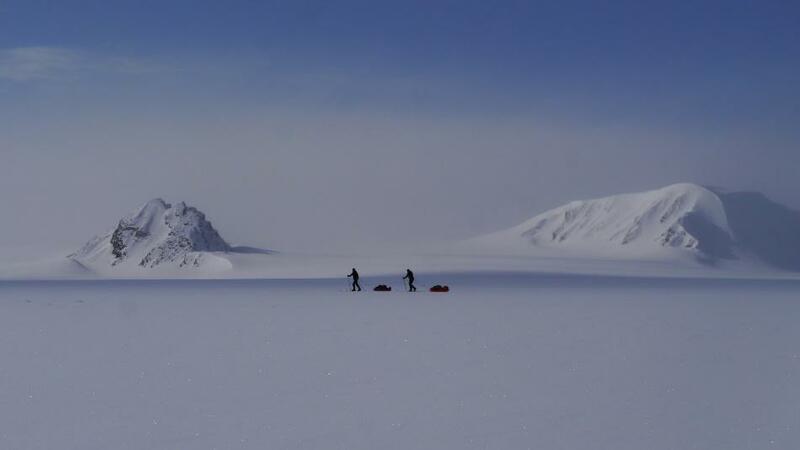 As it tends to happen, plans grow and escalate and we all agreed from the off to make this an unsupported and unguided trip, relying on our own skills and experiences to get ourselves through it. The logical trip seemed to be a crossing from coast to coast, East to West due to time limits. Tom then threw in the idea of heading North and summiting the highest mountain, Newtontoppen, whilst we were at it. This would mean a slight diversion North (actually quite a large, several day diversion) but it gave an excellent objective and a different take on the usual coast to coast. The only snag for me would be the use of Nordic skis and pulling pulks. Now I’ve got no problem with the physicality of pulling pulks; I’d trained with heavy loads prior to my Atlas Mountains trip, so I only had to adapt slightly. The issue was, I’d never skied. Ever. Not even tried it or thought about trying it. So, first things first, Ski lessons. I booked a three hour lesson at the Snow Dome in Milton Keynes, and dragged a friend along for moral support, or rather as a distraction in the hope he would be worse than me and then no one would notice my inability. Having not fallen over by the end, I considered it a success. When planning an expedition, each team member is assigned a role to share the responsibility. We had already agreed this expedition would be completed without the aid of a guide and no outside support. Neil and Leanne took on the logistics for the entire trip; flights, transport, hire equipment, as well as having to write and apply for a permit from the Svalbard Governor. You can’t leave the town of Longyearbyen without express permission, and your route, equipment, experience and safety protocols are examined carefully to ensure you have done all you can to prevent yourself being a rescue statistic, or worse. Tom being our Mapping guru, not only plotted and planned our proposed route, but went to the next went to the extreme of making his own custom maps of Svalbard as well as a GPS version. My task was to work out the food required per day for each team member and prepare an example kit list. The food sounded simple, but when trying to plan for 4000 calories a day, whilst keeping it to only 1kg and £12 per person per day, it got a bit more complicated. Fortunately, I was lucky enough to have some very supportive companies that were interested in our trip and provided some very welcome discounts! Kit wise, we had to be prepared for temperatures of -20, with wind chill potentially dropping it drastically further. As if the bitter cold wasn’t enough, we had to have kit and equipment for glacier crossings; crampons, ice axes, harness rope and rescue kit just in case. Trying to pack all essentials for all eventuality whilst keeping it light proved a bit of a headache, and the kit list was chopped and refined numerous times, even up to the last week. The dates were set, and on the 21st of April, we planned to head out. Everything was packed into two quite large bags and in what seemed like no time at all, April came around. After even more adjustments and faffing with kit later, we were off. Three car journeys, one Air B and B, three flights and one bus ride later, we ended up in our accommodation in Longyearbyen, the largest settlement in Svalbard. With everything checked, and double checked, we loaded up four Snow Mobiles, with a driver each to drop us to the Eastern edge of Svalbard. The guides themselves were surprised with our ambition, and particularly how light weight we were travelling compared to other travellers in this region. We then set off at speed, covering distances in hours that would take us days when we retraced parts of the route on skis. In no time at all, we made it to the sea ice, where we were dropped and unloaded, before being left completely alone amongst the chunks of glacial ice frozen in place by the sea. With the pulks harnessed to us, and skis strapped to our feet, we began. For the next two weeks, the skis would become an extension of us and the pulks would buffer us around as we heaved and slogged along undulating terrain, with the only reprieve being during camping at night. In all, we were dragging near to 50kg each in our pulks. Optimism and excitement powered us through the first day as we headed upwards onto the Glacier Cap, and we felt confident knowing that any distance covered today would be a bonus as we had more time than anticipated. The realisation set in almost instantly on stopping, and the faff of setting up camp began. Even in favourable conditions it took a while to establish some sort of routine. The trip wires needed to be set, and the alarms consisting of a flare and shot gun blanks needed to be armed. Everything else was relatively camp site norm, except perhaps the melting of snow to cook food and prepare drinking water. If that wasn’t enough, due to our proximity to the coast the first round of Polar Bear watch was needed. Basically, it meant we would take in turns throughout the night sitting with the rifle for 2 and a half hours, whilst the others slept, to ensure no curious Polar Bears got too inquisitive. As if the lack of sleep wasn’t enough, the temperature dipped to -20 on my shift. Despite it being 24 hours daylight at this time of the year, the sun’s warmth didn’t reach us as we sat in our dug-out seating position with every item of down clothing we could borrow from each other. Crawling back into my sleeping bag at 0530 in the morning was very welcome. It was a brutal introduction to Polar journeys. We were up again by 0830 and began the rigour of breakfast and de-camping. To fuel us through the day, we reversed our meals and had our main meal for breakfast. Breakfast was also the opportunity to melt more snow for drinking throughout the day, some of which was kept warm in a flask to prevent it freezing. The first day of breaking camp was long, and we left well over an hour late due to our attempt to de-rig the trip wires without setting the alarms off in our faces. Fortunately, from then on the setting up and taking down went much smoother. The first day was a day of learning. Simple things like camp management and establishing our routines. Even the basics, like remembering to keep your pen in your chest pocket so it didn’t freeze. Writing a diary in the evening was easier with a thawed pen. We adopted a good pace on the skis and covered distances faster than we had accounted for, most of this was spurred on by the desire to get far enough from the coast that we would no longer need to do Polar Bear watch. We agreed that every hour we would have a ten-minute break to eat, drink and adjust any kit issues. Those ten minutes went very fast, but the alternative was getting too cold by staying still for too long. The cold wasn’t too bad in the day time as we adapted quickly to the negative temperatures, but it became cutting in the wind or as soon as we stopped. Within the first few days we hit as many challenges as we thought we would encounter over the whole trip. The cold temperatures dipped to the minimum we expected at night, the weather closed in, and we spent half a day battling up hill with the pulks at full weight whilst in a white out. Navigation was horrendous at those times, with myself and Neil taking in turns to navigate by bearings and GPS to make sure our track was running true. We’d frequently drift left or right, and at one point got so engrossed in the rigor of ploughing on, we didn’t check as frequently as we should have and drifted a kilometre in the wrong direction. It was slightly frustrating, but on a vast Ice Cap, we could easily correct our route without adding too much distance on to our journey. First challenge faced, and straight onto the next one. As we crossed the mountains, our route took us towards a valley where it became clear that the glacial cap poured in from three directions, making it a criss-cross maze of crevasses amongst the converging tongues. Picking a route was down to Tom and Neil with their considerable experience at navigating the crevasses. A route was picked from what we could see in front of us, although it stretched beyond what the eye could see. As if the impending danger wasn’t enough, Neil then noticed his pulk bag was smelling suspiciously of petrol. On closer inspection he found the lid on his petrol cannister was undone, and a good litre of fuel had glugged out into the bottom of his pulk. We all chipped in to unload and salvage what we could. Luckily there was no major damage, and after rubbing the effected items down, the sun soon evaporated the petrol from his kit. The only issues remaining would be if Neil would now have enough fuel for him and Leanne to complete the trip, with each bit accounted for daily. We then put on climbing harnesses and roped up for safety, skiing on with Ice Axes to hand in case the need arose to arrest anyone’s fall. We wound between the dimples of crevasses and crossed the snow bridges that held out. All went well until Tom landed face down across a crevasse. His ski had struck a bridge, and the snow beneath one of his feet gave way, leaving a small but gaping hole below with the potential for it to widen. He managed to roll away and fortunately his Pulk hadn’t yet hit the same area, so his weight was spread. We decided the better option was now to aim for one of the pressure zones in the Glacier, where the pressure ridges could be seen to be piling up, and the crevasse directions could be seen more clearly from our new position. After a bit of a back track we carried on. Tom got lucky again as the snow gave way between the end of his skis and the front of his pulk. He was this time left on one side of a crevasse, and the pulk on the other, with his tow poles bridging the gap. Fortunately, either side was pretty stable meaning we could cross, albeit crossing by sliding our skis precariously over the opened fissure. With one end of our long and bendy skis touching one side, and the back on the other, it was then a precarious shuffle to get the skis over to the other side whilst pulling the pulk safely with us. Finally, the route played out safely in front of us and we snuck between the crevasses. The day had been long and challenging, and we were some way off the distance we had hoped to get. Once clear of the crevasses, Neil stowed the rope and we aimed to cross to the other side of the mountain’s shadow to set up camp. I had no idea how much the sun had warmed us even here. As soon as we stepped into the shadow the cold was unbearable. Instantly our faces iced up and hands became numb. I piled available layers on and skied on as fast I could to get out of the shadow. When finally reaching the other side, it was a case of setting up camp as quickly as possible, before the shadow caught up and loomed over us again. Neil was uncharacteristically slow, and it transpired that he was borderline hypothermic, shivering uncontrollably. He piled on as many layers as he could, then got straight into his sleeping bag whilst we quickly set up the trip wires. Fortunately, Leanne was on hand to then cook and help him. It only serves to show how the cold can catch you out, and Neil of all of us was probably more prepared. We were in for a cold night in the shadow of the mountains. It was undoubtedly a beautiful place to be crossing, with snow and Mountains as far as you could see, but It was still mentally challenging when slogging over great distances each day. We even ended up increasing our daily distance to 20km to ensure we stayed on target after a few delays and potential bad weather coming in. Even the beauty of our surroundings did little at times to appease the constant niggling aches and pains we were picking up, as well as the frustrations of the skins on the skis trying to peel themselves off. Our 10 minutes breaks were precious and having to adjust and repair kit meant less rest. In the end I resorted to Duct taping my skins at the tips to the skis to save faffing. I’d learnt in Iceland that the mental part was the hardest part. This time I had brought my MP3 player, primarily for sleeping at night in case my tent mate snored, but actually it became my go to for when I needed that boost to power through and break trail. Two days immediately after the crevasse dodging, Svalbard pushed us again. After picking the wrong route to take around a mountain, we managed to re-work it to our advantage, but it entailed a long slog up steep terrain, ending in an even steeper hill. Tom described it as the “Day of pain” later that evening after our 22km mission through soft snow. 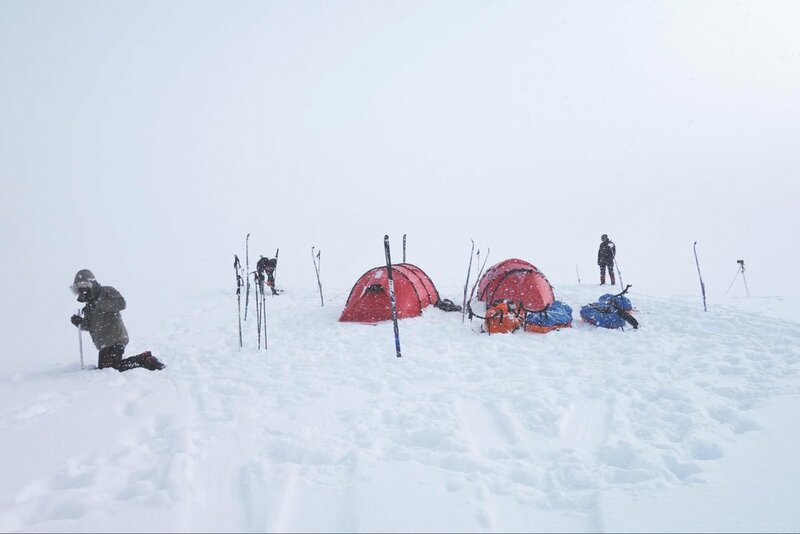 The “Day of Pain” did though bring an advantage, it meant we would be using this campsite for two days, and the following day we would summit Newtontoppen without our Pulks and supplies weighing us down. 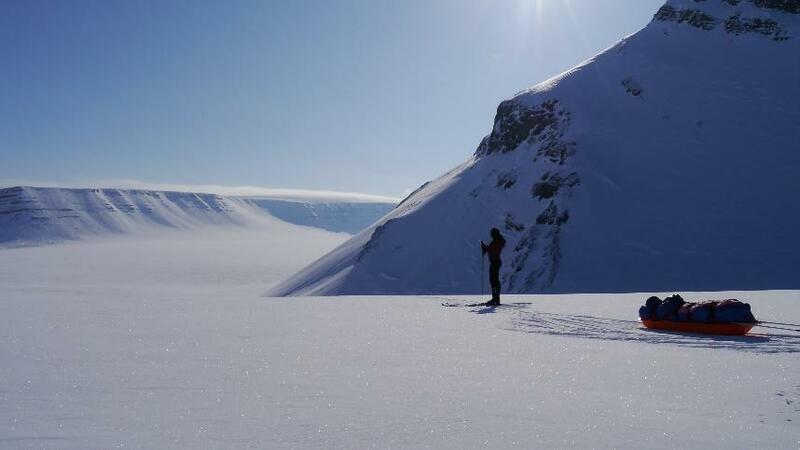 Day six, and we were aiming for our main objective, the highest point in Svalbard. It was relatively easy in terms of Mountaineering. The slopes of Newtontoppen had a gentle gradient and it was simply a walk to the top. Well, a walk in cross country skies on icy snow. This was my first-time skiing without the Pulk weighing me down, or reigning me in. Skiing down into the valley was great fun, and the start was quite relaxed compared to our other days. The hard work began when we started ascending again. The skins, which had blighted much of the early part of our journey with their constant unpeeling, started coming into their own on terrain I could have sworn I was going to slide backwards on. It was steady and hard work until we completed the first section of the mountain. After struggling to slog across icy patches on the skis, Neil, Leanne and I ditched ours and decided to walk the rest. Tom decided he would try and glide the rest. Initially I regretted the decision, forgetting how hard breaking trail in soft snow was, having had the skis do most the work so far. Eventually as the ice hardened it made the climbing easier, with Tom conceding defeat and joining us on foot. The day was hard going, but we eventually reached the summit and gazed over the frozen landscape stretching in all directions before us. Dozens of peaks littered the skyline, some of which still had not been claimed. To the south, our route back was apparent. A barren, featureless area of white stretching to the horizon. The descent was much more forgiving, and we all even decided to give the Nordic skis a run out on the slopes back to the valley. Neil made it look easy, so the rest of us tried. After several tumbles and falling foul to patches of ice, the three of us gave up on the steeper section and stuck to walking. Far more graceful, with the occasional bum shuffle. We had been extremely lucky to have had a clear day, no wind and glorious sunshine during our summit. It held all day which made the 23km we had covered far less gruelling. The following day marked the return south, and a total contrast to the summit day. To start, Tom made a terrible discovery when he retrieved his pee bottle, only to find it was empty, and his water bottle now full. Someone had to do it. His cry of “Nooooooo” still sticks with me. In no time at all we were engulfed by clouds, which eventually turned into a blizzard and a white out. The temperature dropped to -15, and by the end of the day we were all ready to stop. By now camp drills were well rehearsed and setting up in a blizzard was organised if not a little cold. The difficulty of trying to arm a trip wire with chunky gloves on was a pain, but not as painful as removing your gloves and trying it with a bare hand. It took seconds for your fingers to go numb, and minutes to restore the feeling. Despite all the obstacles we encountered, by the evening our morale was great on nearly every day. Huddled in our respective tents, the temperature difference was a good few degrees warmer, although still below freezing. We all adopted our own routines as a group, and as a pair in the tents. Tom was the cook in the evenings, and I took breakfast duty, mainly because Tom was not a morning person… He did however have the camp craft down to a tee, which involved digging out our kitchen area every night and stock piling enough snow to melt the water for us to cook with and drink for the next day. The 29th of April was easily our coldest day. We were battered by the wind throughout the night, and although the snow had stopped falling, the wind had strewn it around the plateau leaving deep soft snow for us to negotiate. The wind was still blowing by the time we broke camp, and today was the first day I piled on multiple layers from the start. The balaclava and goggles were essential to ensure no skin was left exposed, and I dared not check the actual temperature for fear of exposing any part of my body to the cold, and ruining the weather proof seal I had constructed out of the multiple layers. We alternated between me and Neil breaking trail as the soft snow made it particularly difficult. Yet again we found there was all but no visibility, and a compass bearing was needed every few minutes to ensure we kept on track to our 170 degree target. Between breaking trail, Neil and I would swap to second in the line to ensure the leader stayed on track. It was so easy to stray as you trudged mindlessly through a barren, featureless terrain. Had there been any features, we’d not have seen them as visibility closed to less than 20 metres. In fact, had one of the 3000 Polar Bears that inhabited these islands walked by, we’d not have seen them either. Eventually navigation came down to looking at the Snow rime frozen in place by the wind. By lining our route up and intersecting the direction the rime was forming, we made better time with less frequent bearing checks. It was only a few days later we spent our last night on the Glacier Cap. The 2nd of May marked the day we would descend back to the valley and spend the rest of our trip crossing the frozen rivers back to Longyearbyen. The 2nd of May was also my Birthday. Definitely an awesome way to spend your birthday, especially as my team mates had not only brought a card out with them, but had somehow managed to bring, and defrost, some cake for breakfast. The rest of the day was tedious. We had picked a route out on the maps that followed a gorge leading back to the Valley below. Initially it started out well, and we rode the pulks down some sections to lose altitude. The joy was short lived though as the steep sides and snow build up meant man hauling our pulks up the side of the gorge to try and pass blocked sections. This then meant lowering the Pulks back into the Gorge again. Progress wise this was our worst day, having covered only 11km in 9 hours. It was hard going physically, and the last stint was hauling all four pulks out of the gorge by rope. We rebelled that evening and had an extra Expedition meal instead of our usual porridge, and then tucked in to the remaining babybels we hadn’t eaten that day. Babybels were like currency on the expedition, I think Neil would have traded half of his food for a few extra ones. The end was getting closer. We had roughly 50km to cover to reach the sea, and by now we were on the Snowmobile Highway. People frequently drove pass us as they went out on day trips to some of the tourist destinations in Svalbard. The temperature also rose, and -3 degrees felt warm to the point we were skiing in our base layers to prevent over-heating. Camping options also reduced, and we ended up pitching on the ice with Tom improvising V threads to pitch the tent into the solid ground. Despite the length and strenuousness of our journey, we were all holding up well. The 4000 calories a day was doing its job, and the only major casualty was our feet taking a battering from the ski boots. The end was tantalisingly close now, and it kept us going. We hadn’t realised it, but the 4th of May marked our final day. We had planned to split the last stretch into two days, camping on the town limits. As we approached the coast though, the level of thawing surprised us. The frozen river was getting slushy, and the melt from the mountains was now flowing over the top of the ice, leaving our pulks floating at points where we had to cross to drier ground. This meant the camping spots were reduced to slushy banks surrounded by the melting snow, which ruled out most of the spots on our course to the coast. The only other choice was a massive diversion to one of the neighbouring valleys. After checking out, and ruling out, a few boggy camping spots we decided to finish it that day. We were about 7km from the coast, and rather than end camping in mud and snow melt, we decided to finish on a high and push for the sea. We ditched our skis, which were now redundant, and pushed on along the snow mobile tracks at the roadside. Their route along the roads themselves had also been severed by the thaw, and in places they were skimming across the water to get back on course. By 1930, we had done it, we stood on the edge of a thawing ice shelf being lapped by the sea at the West cost of Svalbard. 13 days earlier we had left Longyearbyen on Snowmobile, and after travelling 250km, we had made it back through varying conditions and challenges, a day earlier than planned. The accomplishment was not to be underestimated. We had between us crossed the Arctic Archipelago unguided and unsupported despite no previous Arctic experience. It was a step in the right direction to push closer to the ultimate dream of polar travel. Follow Ben’s adventures on his Instagram here.